How do you define comfort food? For me, cheese must be involved. And a lot of it. I also need some sort of carb - be it pasta, potatoes, whatever. Anything else is just a bonus, but those are my main requirements. 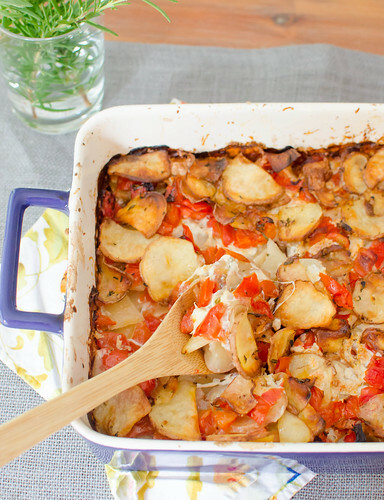 So this potato bake is some major comfort food. It has thinly sliced potatoes, seasoned with garlic, rosemary, and salt, and layered with chopped tomatoes, mozzarella, and parmesan cheese. After baking, you are left with what I would consider a pretty awesome dish. There is a blanket of perfectly crispy potatoes covering a bed of soft, creamy, cheesy potato goodness. The rosemary and tomatoes give the dish a nice burst of freshness. I couldn't decide if I liked the crispy top layer or the creamy interior. Because if there is anything better than a crispy, salty potato, it would be a soft, creamy, cheesy potato. This is one of those dishes that I kept sneaking bite after bite as I cleaned the kitchen that night. I had originally planned to save enough to serve with breakfast - how fabulous would this be topped with a poached egg?! But alas, Joey and I couldn't keep our forks out of this, and um, we finished the whole thing. Sorry not sorry. serves 4-6 as a side. Or 2-3 as a main dish, apparently. Preheat the oven to 400 degrees Fahrenheit. Brush 1 tablespoon of the oil over the bottom and sides of a 9x13 inch baking dish. Set aside. Combine the remaining 3 tablespoons of the oil with the rosemary, garlic, salt, and pepper. Slice the potatoes as thinly as you can - preferably 1/8-inch. Using a food processor with the slicing blade attachment works really well, as does a mandolin. But a sharp knife works just fine. Place the potatoes in a large bowl and toss with the oil mixture, coating them evenly. Line the bottom of the baking dish with one third of the potatoes, slightly overlapping the slices. Sprinkle with half the mozzarella, half the parmesan, and half the tomatoes. 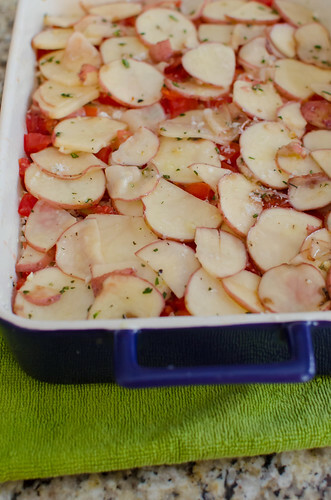 Repeat the layering of potatoes, cheese, and tomatoes one more time, then finish by topping with the remaining potatoes. If there is any of the oil mixture pooled at the bottom of the bowl, drizzle it over the top. Sprinkle very lightly with salt. (At this point, the casserole can be covered and refrigerated overnight. Bring to room temperature before baking). Cover with foil and bake 40 minutes. Remove the foil and bake an additional 20 minutes, or until the top layer of potatoes is golden-brown. Allow to cool 5 to 10 minutes before serving. I love big, cheesy, casseroles like this! Looks awesome! I'm a sucker for a good potato dish. This looks GOOD. This looks delicious...I will try it when the heatwave breaks! Cheesy comfort food pretty much always sounds good to me! I love that it has a combination of crispy and creamy textures...I feel like those are pretty key as well.